Kosher Creations elevates catering to an art form. Like any artist, we begin with a concept, developed with you, the patron. We then fill in the details with the finest of materials, craftsmanship, and professional dedication. With the freshest and highest quality ingredients, creative passion, the best trained staff, and the strictest standards of kashrut, Kosher Creations creates a new paradigm in the world of catering. We believe that food and service within a Jewish context can elevate the spirit and comfort the soul. Get more for your wedding! 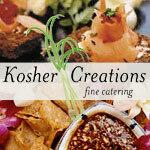 Don't forget to mention ChossonKallah.com when visiting Kosher Creations.